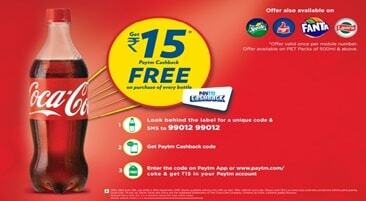 Grab the new Paytm Coca Cola offer now. You can grab up to Rs 315 Paytm cash for free. Buy the new Coke Products like Thumbs Up, Maaza, Coca Cola and more. Get the 14 digits cash code and activate it via SMS. Get the unique Paytm Mall 13-digits cash code and note it down. Redeem the code on www.paytm.com/social page. This offer is valid till 14th November 2017 only. So, hurry up to redeem to offer code. First of all, buy the new Coca-Cola Company cold drinks (Sprite, Fanta, Coca Cola, Thumbs Up, and Limca). The free Paytm Cash offer should be there. Find the 14-digit unique code under the label. You when purchasing the 2l and 2.5l pack with Rs 15 on bigger variants. Before this campaign, we all redeem code directly on the Paytm Mall site. But now, you need to activate the code via SMS. First, send the Paytm Coke Code to 9901299012. Enter the 14-digit code in your Mobile Messaging app. That’s it! You will receive the new 14 digits Paytm Redemption Coke Code. Activating the cash code via above method is important. Get the unique coupon code printed behind the label on the bottle. Visit the Paytm Coca Cola Offer code redemption page by Clicking Here..
Now enter the promo code (14-digits) you got via SMS. Click on “Proceed” button >> Sign-in to your account. You will receive the Paytm cash for FREE instantly. The Coke offer is only available for redemption upto 4 times. So, with total 4 cash codes, you will get upto Rs 315 cash in Paytm wallet for free. The Paytm cash will not expire from your account. So, you can redeem the amount anytime on any service. But, you can’t transfer it to any bank account. It is also not transferable to other user’s account. Utilize the money on mobile and DTH recharge or mall shopping. This Coca-Cola freebie offer is similar to the Paytm CloseUp Offer, Maggi Offer code and much more. Get the 14 digits code from the Coke, Thums up, Sprite, Fanta bottle. Then, activate it via SMS. You will receive another 14-digits code. You need to redeem that on Paytm.com or app. Visit www.paytm.com or open the app. Get maximum cashback of Rs 315 in Paytm Wallet. Please notice the Paytm Campaign on the Cold Drinks bottle. You need to activate the code via SMS. Redeem it on www.paytm.com/ Paytm app only. This offer is Valid unti 30 September 2018. One winner on the Lucky draw will win 1 Lac Paytm cash.